Desert Air Conditioning, Inc. can make you a Happy Customer! We install, repair and maintain most air conditioning and heating systems available today! We only instal quality, energy efficient air and heat products to ensure you and your family’s comfort any time of the year. Call Desert Air Conditioning, Inc. today and see how we can make you a happy customer! 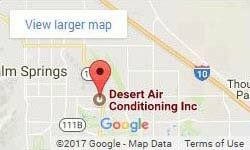 Desert Air Conditioning, Inc. delivers innovative, energy-efficient, products from Lennox and other major, quality manufacturers in the Air Conditioning and Heating industry. Please see our Products page for more information. For select high-efficiency systems, extended warranty protection is available when you register your product name. Desert Air Conditioning, Inc. customer’s can take comfort knowing that the products we install are backed by the best warranties in the business.